Ludmila Anselm was born in Siberia, where she lived through the war and studied until entering Leningrad State University. She graduated in 1956 and did research in solid state physics for many years until she decided she was more interested in theater than in atoms. She has been living in Boston since 1997. 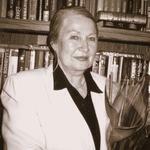 She is a specialist in Shakespere and Russian authors and poets. Her full length play Now I Love You Best (Having assumed as a basis the sonnets by Shakespeare, she made an effort to penetrate into Shakespeare’s inner world) was vanity published in Russian and English in 2004. The first act was read at Playwrights’ Platform in 2005. She is a member of Sean Bennett’s Playwrights’ workshop and Playwrights’ Platform both of Boston, and The Dramatists Guild of America, New York City. Play Orpheus (45 min) (insights into the uncertain hell of Russian communal living compared with Orpheus and Eurydice experience in hell) in Russian, Novi Journal 3.93 issn 0869-24 Saint Petersburg 1993. Story: “French Relatives” in Russian, Novi Cosmopolitan December 2004, Boston, Mass.